David has been playing solid squash for the boys varsity team this season sporting a team best 6-2 record. Last week he defeated opponents from Hotchkiss and Suffield. David has a great work ethic and is a great teammate both on and off the court. 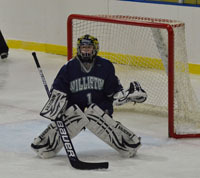 Miranda has been outstanding in goal for the girls varsity hockey team this season. Last Wednesday she earned a shutout in the team’s 4-0 home victory over a solid Taft squad. Last week Ben’s positive energy and clutch play helped the boys’ third basketball team erase a 10 point deficit against Suffield in an exciting comeback win. Ben scored 10 points with 5 rebounds and 2 assists in the game.